I had something else entirely in mind for the Protection challenge. Then, I was talked into participating in the larp Fairweather Manor in Poland with about three weeks notice and thought I wouldn't do that challenge at all. But then again, what is protection, really? I was thinking in something to keep me warm, or perhaps a new apron (both needed), but then again, clothes can be a very different kind of protection after all. 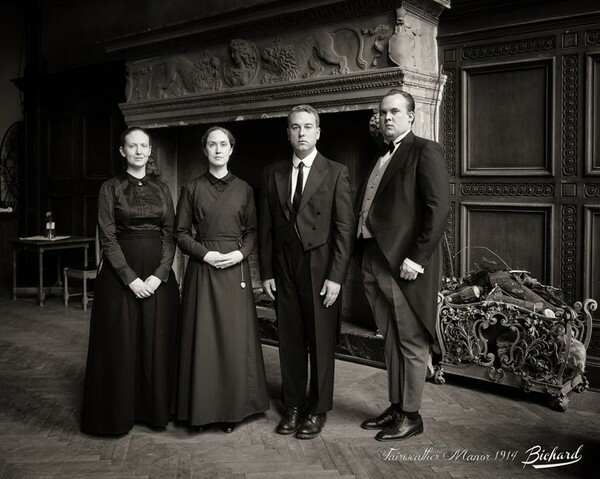 Fairweather Manor is heavily inspired by Downton Abbey, set in April 1914 (so before the war) and since I apparently momentarily didn't turn on the safety systems in my brain, I ended up with the housekeeper part. Which is a great part already on paper, but also very, very scary. Therefore: first part of the "protection": protection for me. I needed to have a reasonably good outfit, that made me feel I looked the part and not like I was heading for a theme-party. Second part of the protection: Protection for my character. Her clothes would be her image to the outside world, the mental armour. I have never done 20th century. I love the look, but I've never tried it. I knew exactly nothing about the actual construction, at least in practics. Thankfully, my family keeps stuff. My great-great grandmother's stuff is, to some extent, still around. She married in 1894, and stuff from that time onwards is still in storage at my grandmother's. There, I found underskirts and a coat (lovely, but I ended up not using it, since Poland said it was summer and the coat was more of a winter coat). There were also corset covers, shifts and even a corset. The latter was sadly too early in shape and too big for me, as well as too worn to use, but a friend actually had a corset roughly my size - at least enough to create the firmness of shape needed. 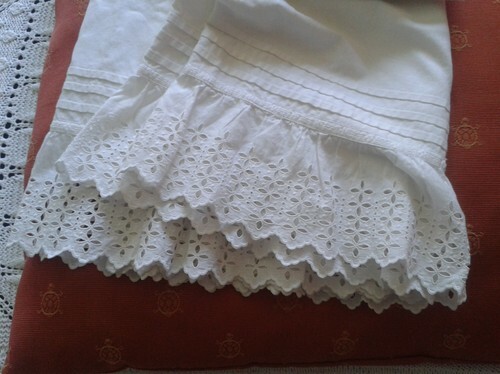 So; I had the underpinnings, and very pretty they were, too (though not really over-the-top, it seems early 20th century stuff can't be anything but a soft and nice and pretty look). I mean, look at it! And this was the least pretty one, since the prettier one was slightly too small and I hadn't time to fix it. There was, however, nothing soft and nice and pretty about my character, so I needed an outer layer to match. The inspiration was of course obvious (and really, who doesn't like Mrs Hughes??!). From season 1. 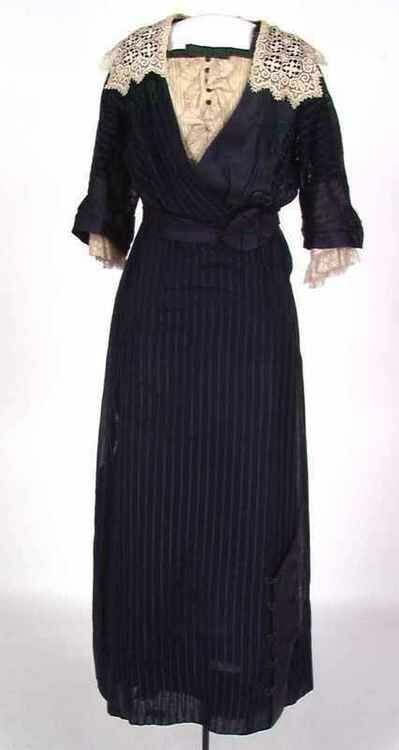 Stripes, overlap in front, no excess fabric, conservative skirt length, a lovely chateaine. Sleeves apparently curved rather than straight - a feature I'm used to from 16h century dress. Visible front seams leading me to guess a five-gore skirt. 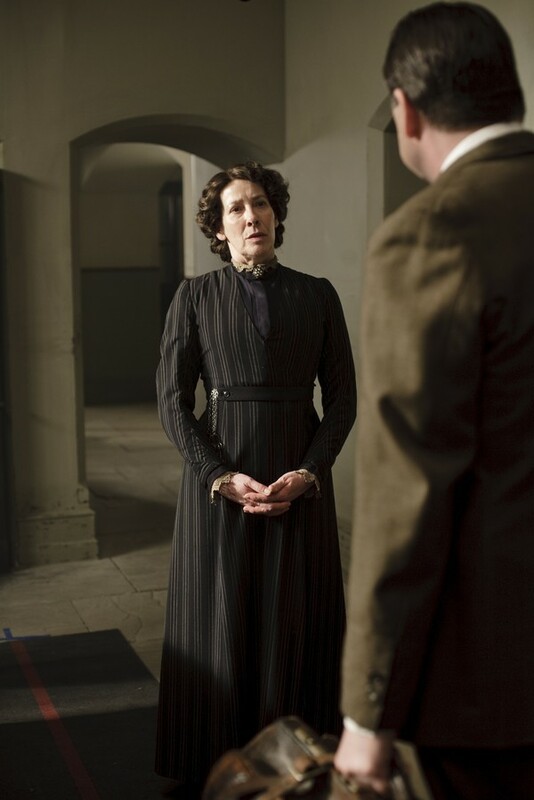 However: Yes, Downton abbey is wonderful. The costumes are wonderful. But even though it was a larp I was making the dress for, the HA ambitions couldn't be all ignored. So. Were there any references whatsoever that supported at least the basic ideas? Well. Sort of. This on Past Patterns supported the overlap front, though the skirt is of a different construction and the bodice has a more generous fit. Since I was short of time, I decided to try to combine the two to some extent and say "good enough!" From the Historical Sew Fortnightly group I got an unanimous "get a corset!!!! ", and I was very happy about it now. 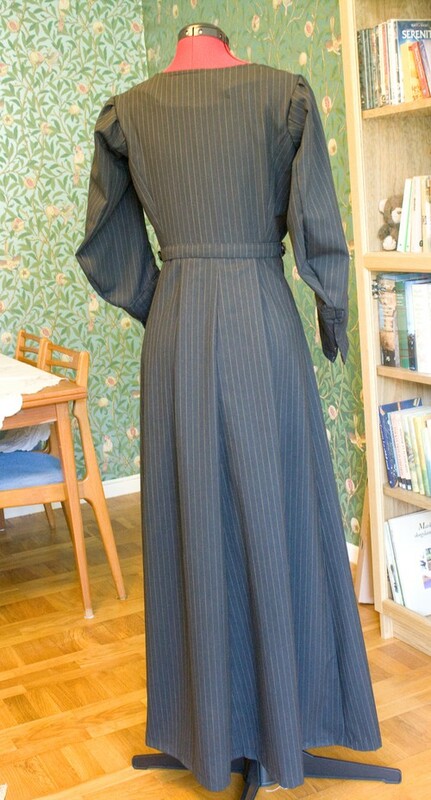 This dress from 1916 (Norway) should not be too off as a reference either. I know I don't do the most blingy things. I know I have issues (I'm working on them!) with leaving the "less is more" idea behind when I do 16th century. But for this, even I had to restrain myself. "Colour?" NO. Really. "Neckline?" NO. Don't be silly. "What about a patterned fabric, to set the character apart from the ladies' maids?" Alright then. But make it understated. And so I found a greyish black 'wool' (the seller says '100% pure new wool', I say I don't believe it after seeing it catch fire in the burn-test I did, but for this project it was more than ok). Puritans, avert your eyes... For the bodice, I used the pattern I just had constructed for the Tudor tailor woman's doublet, but altered the sleeves and the front, shortened it and added the skirt. Perhaps foolishly, I added a waistband in between the bodice and the skirt. In hindsight, that added some bulk around the waist where I'd rather not wanted to have it, but I didn't really have time for second thoughts. For the skirt, I simply decided I wanted a five-gore thing with the closure in one of the front seams, cut the pieces and pinned until I was happy. Then I added a buttoned belt, and two buttons on the other side to (somewhat) keep the belt from sliding down when I hung keys and such from it and I was done. All of it (more or less) machinesewn. Hooks and eyes for front closure and snap buttons for the front skirt and upper bodice closures. Done! To achieve the high-necked look I wore a blouse underneath. Added benefit: I could change blouses. Not a bad thing when you spend 15 hours a day walking up and down hallways in a rather warm Polish castle, I can tell you that. The front. 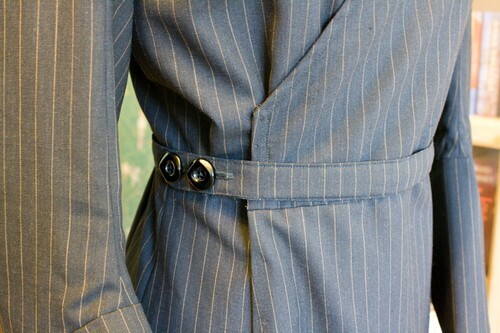 The extra width in the bodice is mostly gathered in the sides, to keep the front smooth. I didn't quite get rid of the pull in the fabric, it's a fitting issue I didn't have time to solve. The front closure and the belt. Hooks and yes under the belt, snap buttons aboive and below. Fit issues rather apparent, sadly, and the buttons are plastic ones. The back. Imagine how annoyed I was when I far too late realised that I had put the boxpleat in the back reeeeeaaaaaallly off to one side. No idea how I managed to do that. No time to fix it. Arrrrgh. And finally, a rare ingame pictures. Yes, there were name-tags ;) Photo (c) John-Paul Bichard If you have Facebook, there are also a lot of amazing photos on his Facebook page. Mrs Cooper wasn't one for smiles. At all. Look how very serious we are. 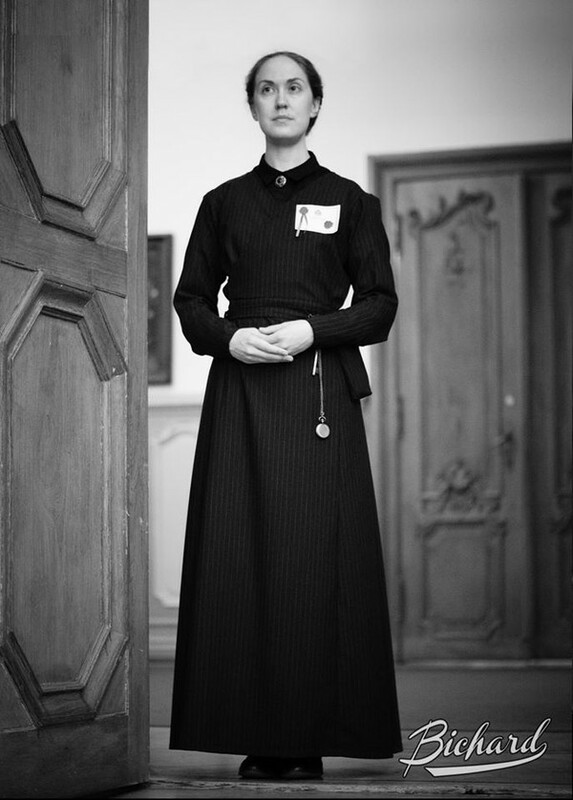 This was the ingame portraits: "Now, stand very still..."
How historically accurate is it? I really don't know enough to tell, so I'd say perhaps 50%. Total cost: About 30 euros. The fabric cost me more, but I have enough for at least one dress more in my stash now, so counting only the fabric used for this dress.